If there’s one thing I’ve learned in my 14 years of being a Designer + Digital Strategist, it’s that us business owners bite off more than we can chew. From overestimating how much time you have in the day, and committing to doing too many things, to launching several digital products all at the same time, whilst going through a re-brand, and creating a new online course and virtual retreat. I totally get it–your ideas are brilliant, you want to put them out in to the world, and you wanna have your own “six figure launch” because everyone else on the internet is doing it, too. The first thing you gotta do, is test your idea to see if it’ll sell. How? Let’s say you have several ideas for upcoming digital products you wanna make. You can create a survey using a free tool like SurveyMonkey and send it to your e-mail list and social media accounts so your subscribers can vote for which one they’re most interested in. You can conduct one-on-one interviews about your idea with potential customers and get their feedback, their thoughts on what they want to learn, their fears, etc… Oh, and P.S. : All of this information is great to include on your sales page/marketing materials when you create one! You can create a Facebook ad campaign around your new product/service/event that sends people to a killer landing page design that collects e-mail addresses of people who are interested in purchasing once your product becomes available. You can even use that expertly designed sales page to pre-sell your new product/service/event before you build it, so you’re totally 100% sure you’re on the right track with an idea that’ll sell from the get-go. After all, nothing is a bigger gauge of if your idea has merit than when you ask people to put their money where their mouth is. you reduce your risk of accidentally creating something no one will buy. You save yourself loads of time, money and sanity — you can quickly run a few surveys, talk to a few ideal customers, collect a few e-mail addresses, and see if your idea has legs. If no one signs up on your e-mail interest list? No biggie. Move on to your next idea knowing full well you didn’t waste anymore time, money or resources than necessary. If people do sign up, and you pre-sell your program? Well, my friend, that’s all the validation you need to know that you’ve got one great idea on your hands and you can now start to run with it! Next, I wanna hear from you. Simply come on over to my Facebook page and tell me all about your next big idea. Do you want to create a new online course? A new physical or digital product? Introduce a new service? Create an in-person or online event? How can you use an MVP-style approach to guarantee it’ll sell before you even create it? 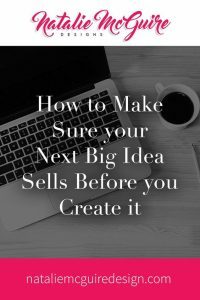 I can’t wait to hear all about your ideas and work with you to create an idea that sells!